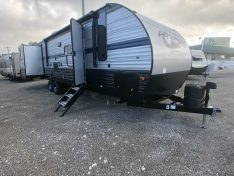 This double over double bunkhouse by KZ Sportsmen LE is a great travel trailer that fits the whole family. When you enter the 281BHKLE you will notice the double over double bunks to your left with room for sleeping 4 people. Next to the bunks is the full bathroom with a shower/tub, foot flush toilet and sink. In the main living you will see the large slide out with a u-shape dinette and sofa sit across from the entertainment center. The kitchen offers great prep space with a 3 burner cook top, deep sink and gas/electric Refrigerator. The master bedroom has a queen walk around bed with wardrobe on each side and plenty of space. 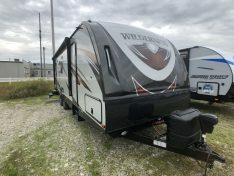 On the outside of the 281BHKLE there is a outside kitchen, 18’ power awning and full pass thru storage in the front!